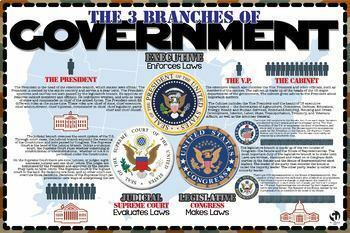 Social Studies, especially the workings of the government, seems more important for students to know than ever before. 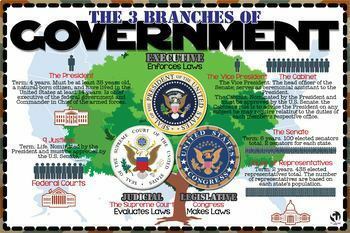 Many school districts seem intent on pushing world history, state history, even geography, over teaching about the government, civics, and citizenry. 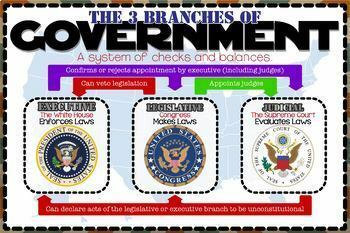 To that end, I present you with this poster depicting the 3 branches of government. There is a version in a summarized form aimed at primary grades and one with more comprehensive information suitable for reading comprehension exercises. I have included a separate resource in Spanish. I am not a native speaker, relying solely on Google Translate to do the bulk of the work, I hope that the translation is accurate. No soy un hablante nativo de español. Estoy usando aplicacione para traducir mis cartas de anclaje al español. ¡Si hay cualquier error grmmatical por favor notofy yo inmediatamente! Document dimensions 24"x31" (scaled up from a letter-size format). It will print safely on regular copy paper. Make sure that you have your settings to fit the document to print before you actually print. Not a lot of wall space? Want to save paper? Display this on your interactive whiteboard during the lesson. It is a high-resolution vector-based illustration created in graphic design software. This file cannot be edited in any office software (ex, Word, Powerpoint).However, I discovered that you can use Inkscape, a FREE vector-based program, to open and edit the PDFs included in the download, although you will most likely need to make some adjustments to the file after you do. 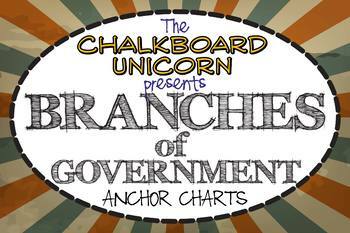 This will enable you to use vector-based graphics for cleaner anchor charts/posters. If you spot a typo or other errors contact me immediately for a revision. I try to proofread my own work and have other sets of eyes check it as well, but some things slip through. I can make corrections nearly immediately. Don't hesitate to contact me. If you need a custom version of this file, please don't hesitate to contact me.